Be a permanent part of Queens College. 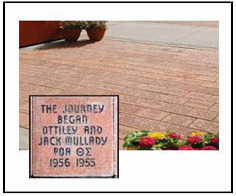 Whether your inscription is on a bench or tree plaque, a seating plaque in one of the Kupferberg Center theatres, a brick in Alumni Plaza across from Jefferson Hall, or inserted in a Bouquet of Books for the Rosenthal Library, your gift will last a lifetime. QC Love Locks Are you and your spouse QC Lovebirds? Did you meet your best friend at QC? Or do you just love Queens College? 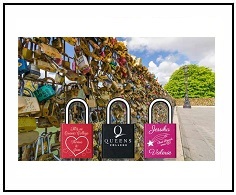 We are offering a new commemorative item this year “QC Love Locks” ! Show your affection for one another by ordering a personalized lock to keep or have on permanent display at QC! Love Locks come in 3 colors. New! 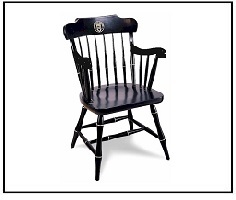 Executive Chair Classic chair personalized with the Queens College motto “Discimus ut Serviamus: We learn so that we may serve” and your own message. Displayed inside an executive office or VIP lounge area. Bricks will be placed in Alumni Plaza across from Jefferson Hall. Designated areas can be reserved upon request for class members, sorority sisters, fraternity brothers or houseplan members, etc. 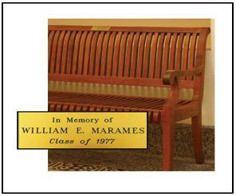 Bench Plaque A beautiful wooden bench personalized with your engraved plaque will be placed inside a campus building. 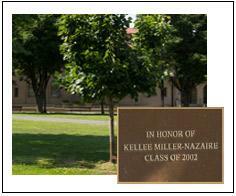 Tree Plaque Choose a living tribute to help beautify the 77-acre College landscape. A bronze plaque will be placed at the base of your tree. 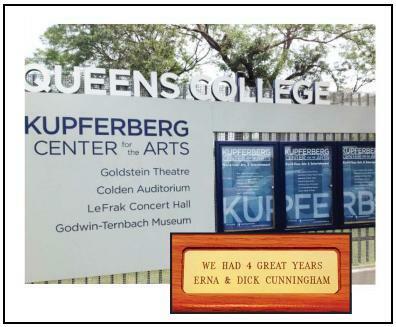 Kupferberg Center Seating Plaque will be placed on the armrest of one seat in either the 475-seat Goldstein Theatre or the 2,140-seat Colden Auditorium. 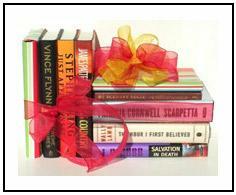 Bouquet of 10 Books Knowledge is the best gift of all. What better way to demonstrate that than by helping the Rosenthal Library grow its collections? Each book in the Bouquet will include a dedication in the record of the title for all to see. For more information, contact the Institutional Advancement Office at 718-997-3920.